This book examines the roles of spiritual masters and disciples in the quest for enlightenment. Although the book’s discussions center on Eastern-style gurus and the Eastern goal of enlightenment (i.e. obliteration of the ego to freedom), there is much of value to students and teachers on any spiritual path. The author fully explicates the benefits and dangers of the master-disciple relationship. Many Americans may be skeptical of the master-disciple relationship because of the flagrant and sometimes fatal abuses of brain-washing cults. The author discusses the issue of Western cultural perceptions, and offers numerous criteria for the student seeking this type of personal development. Caplan addresses her topic in a thorough, orderly and multi-leveled fashion. The veracity of her insights is strengthened by shared episodes from her search for a guru. 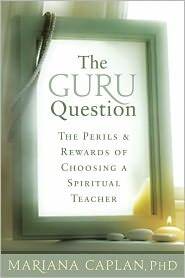 Her crazy escapades with false teachers reveal the depth of her commitment to finding a guru. She tenaciously persisted in her pursuit of a spiritual teacher until she found one. Having walked the walk, now she can talk the talk. There are no magic bullets here: no perfect formula for finding a teacher, and no easy path to enlightenment offered on a silver platter. The quest for enlightenment requires sustained effort, dedication, trust, and obedience. The author is, in turn, skeptical of self-styled New Age “masters” who promulgate teachings without a spiritual lineage. While there are potential disappointments in the “spiritual supermarket,” disciples and teachers must be conscious and bear full responsibility for choices and roles. The author outlines the differences between a blind follower and a conscious disciple, or between a genuine guru and a soul-sucking charlatan. Rules, ethics and moral standards don’t always apply to the master-disciple relationship, but the disciple must be able to refuse or say no. The Epilogue in this new edition, “An Unexpected Twist: False Complaints Against Teachers,” relates the effects of career-crushing accusations against the author’s partner, Marc Gafni. The Appendix contains an invaluable collection of interviews with some of the leading lights in the spiritual world. The dialog with psychologist John Welwood offers excellent ideas to consider about the transfer of traditions from the East to the West. This is a well-written book on a topic that doesn’t get enough coverage. Although the bias is toward Eastern mysticism, the examination of the roles of teachers, leaders and authority figures is highly relevant to modern Neo-pagans, as are the remarks about the roles and responsibilities of students and followers. There are pitfalls on both sides of this experiential equation, and Caplan does a great job of elucidating them, in addition to summarizing the many benefits that can be gained from spiritual relationships. Recommended for both teachers and followers on any non-traditional spiritual path. Note: This is a revised edition of “Do You Need A Guru: Understanding the Student-Teacher Relationship in an Era of False Prophets” (Thorsons, 2002). The Epilogue is new material, and some of the internal content has been updated.